This article is about the Holy Roman Emperor. For other uses, see Henry IV. Henry IV (German: Heinrich IV; 11 November 1050 – 7 August 1106) ascended to King of the Germans in 1056. From 1084 until his forced abdication in 1105, he was also referred to as the King of the Romans and Holy Roman Emperor. He was the third emperor of the Salian dynasty and one of the most powerful and important figures of the 11th century. His reign was marked by the Investiture Controversy with the Papacy. Several civil wars over his throne took place in both Italy and Germany. He died of illness, soon after defeating his son's army near Visé, in Lorraine, France. 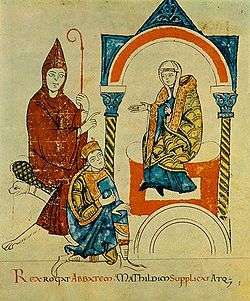 In 1056 at Aachen, Henry IV was enthroned as the King of the Germans by Pope Victor II, while his mother, Agnes of Poitou, became regent. In 1062 the young king was kidnapped as a result of the Coup of Kaiserswerth, a conspiracy of German nobles led by Anno II, Archbishop of Cologne. Henry, who was at Kaiserwerth, was persuaded to board a boat on the Rhine; it was immediately unmoored and the king jumped into the river, but he was rescued by one of the conspirators and carried to Cologne. Agnes retired to a convent, and the government was placed in the hands of Anno. His first action was to back Pope Alexander II against the antipope Honorius II, whom Agnes had initially recognized but subsequently left without support. Anno's rule proved unpopular. The education and training of Henry were supervised by Anno, who was called his magister, while Adalbert of Hamburg, archbishop of Bremen, was styled Henry's patronus. Henry's education seems to have been neglected, and his willful and headstrong nature developed under the conditions of these early years. The malleable Adalbert of Hamburg soon became the confidante of the ruthless Henry. Eventually, during an absence of Anno from Germany, Henry managed to obtain control of his civil duties, leaving Anno with only an ecclesiastical role. Henry's entire reign was marked by apparent efforts to consolidate Imperial power. In reality, however, he carefully worked to maintain the loyalty of the nobility and the support of the pope. In 1066, he expelled from the Crown Council Adalbert of Hamburg, who had profited from his position for personal enrichment. Henry also adopted urgent military measures against the Slav pagans, who had recently invaded Germany and besieged Hamburg. In June 1066 Henry married Bertha of Savoy/Turin, daughter of Otto, Count of Savoy, to whom he had been betrothed in 1055. In the same year, at the request of the Pope, he assembled an army to fight the Italo-Normans of southern Italy. Henry's troops had reached Augsburg when he received news that Godfrey of Tuscany, husband of the powerful Matilda of Canossa, marchioness of Tuscany, had already attacked the Normans. Therefore, the expedition was halted. In 1068, driven by his impetuous character and his infidelities, Henry attempted to divorce Bertha. His peroration at a council in Mainz was rejected, however, by the Papal legate Pier Damiani, or Peter Damian, who hinted that any further insistence towards divorce would lead the new pope, Alexander II, to deny his coronation. Henry obeyed and his wife returned to Court. Henry believed that the Papal opposition was less about his marriage than about overthrowing lay power within the Empire, in favour of an ecclesiastical hierarchy. In the late 1060s, Henry demonstrated his determination to reduce any opposition and to enlarge the empire's boundaries. He led expeditions against the Lutici and the margrave of a district east of Saxony; soon afterwards he had to quell the rebellions of Rudolf of Swabia and Berthold of Carinthia. Much more serious was Henry's struggle with Otto of Nordheim, duke of Bavaria. This prince, who occupied an influential position in Germany and was one of the protagonists of Henry's early kidnapping, was accused in 1070 by a certain Egino of being privy to a plot to murder the king. It was decided that a trial by combat should take place at Goslar, but when Otto's demand for safe conduct to and from the place of meeting was refused, he declined to appear. He was declared deposed in Bavaria, and his Saxon estates were plundered. However, he obtained sufficient support to carry on a struggle with the king in Saxony and Thuringia until 1071, when he submitted at Halberstadt. Henry aroused the hostility of the Thuringians by supporting Siegfried, archbishop of Mainz, in his efforts to exact tithes from them. More formidable still was the enmity of the Saxons, who had several causes of complaint against the king—he was the son of one enemy, Henry III, and the friend of another, Adalbert of Hamburg-Bremen. The momentum for a reform of the church had its clear beginning during the reign of Henry's father, in the short but effective pontificate of Leo IX, whom Henry III had nominated. Since that time, the reforming initiative had been carried on by men like Cardinal Bishop Humbert of Moyenmoutier and St. Peter Damian. After the death of Cardinal Humbert, who had called for a return to the old canonical principles of free election of the papacy and the emancipation of the Church from the control of the secular power, the leadership of the reform movement passed to younger men, of whom the Tuscan monk Hildebrand, a follower of Humbert, stood foremost. Hildebrand ascended the papacy in 1073 as Gregory VII. While Henry adhered to Papal decrees in religious matters to secure the Church's support for his expeditions in Saxony and Thuringia, Gregory saw the opportunity to press the Church's agenda. The tension between Empire and Church culminated in the councils of 1074–75, which constituted a substantial attempt to undo Henry III's policies. Among other measures, they denied secular rulers the right to place members of the clergy in office; this had dramatic effects in Germany, where bishops were often powerful feudatories. By this ruling, they freed themselves from imperial authority. In addition to restoring all privileges lost by the ecclesiasticals, the council's decision deprived the imperial crown of almost half its lands. This weakened national unity, especially in peripheral areas such as the Kingdom of Italy. Suddenly hostile to Gregory, Henry did not relent from his positions: after defeating Otto of Nordheim, he continued to interfere in Italian and German episcopal life, naming bishops at his will and declaring papal provisions illegitimate. In 1075, Gregory excommunicated some members of the Imperial Court and threatened to do the same to Henry himself. Furthermore, in a synod held in February of that year, Gregory clearly established the supreme power of the Catholic Church, with the Empire subjected to it. Henry replied with a counter-synod of his own. The beginning of the conflict known as the Investiture Controversy can be assigned to Christmas night of 1075: Gregory was kidnapped and imprisoned by Cencio I Frangipane, a Roman noble, while officiating at Santa Maria Maggiore in Rome. Later freed by Roman people, Gregory accused Henry of having been behind the attempt. In the same year, the king had defeated a rebellion of Saxons in the First Battle of Langensalza and was therefore free to accept the challenge. At Worms, on 24 January 1076, a synod of bishops and princes summoned by Henry declared Gregory VII deposed. Hildebrand replied by excommunicating the king and all the bishops named by him on 22 February 1076. In October of that year a diet of the German princes in Tribur attempted to find a settlement for the conflict, conceding Henry a year to repent from his actions, before the ratification of the excommunication that the pope was to sign in Swabia some months later. Henry did not repent, and, counting on the hostility showed by the Lombard clergy against Gregory, he decided to move to Italy. He left Speyer in December 1076, spent Christmas in Besançon and, together with his wife and his son, he crossed the Alps with help of the Bishop of Turin and reached Pavia. Gregory, on his way to the diet of Augsburg and hearing that Henry was approaching, took refuge in the castle of Canossa (near Reggio Emilia), belonging to Matilda. Henry's troops were nearby. 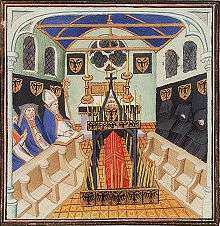 Henry's intent, however, was apparently to perform the penance required to lift his excommunication and ensure his continued rule. The choice of an Italian location for the act of repentance, instead of Augsburg, was not accidental: it aimed to consolidate the Imperial power in an area partly hostile to the Pope; to lead in person the prosecution of events; and to oppose the pact signed by German feudataries and the Pope in Tribur with the strong German party that had deposed Henry at Worms, through the concrete presence of his army. Henry stood in the snow outside the gates of the castle of Canossa for three days, from 25 January to 27 January 1077, begging the pope to rescind the sentence (popularly portrayed as without shoes, taking no food or shelter, and wearing a hairshirt - see Walk of Canossa). The Pope lifted the excommunication, imposing a vow to comply with certain conditions, which Henry soon violated. Rudolf of Rheinfelden, a two-time brother-in-law of Henry, along with allied German aristocrats, took advantage of the momentary weakness of the king in what became known as the Great Saxon Revolt. Rudolf declared himself anti-king by a council of Saxon, Bavarian, and Carinthian princes in March 1077 in Forchheim. He promised to respect the electoral concept of the monarchy and declared his willingness to submit to the Pope, to which the Pope agreed. Despite these difficulties, Henry's situation in Germany improved in the following years. When Rudolf was crowned king at Mainz in May 1077 by one of the plotters, Siegfried I, Archbishop of Mainz, the population revolted and forced Rudolf, the archbishop, and other nobles to flee to Saxony. Positioned there, Rudolf was geographically and then militarily deprived of his territories by Henry; he was later stripped of Swabia as well. After the indecisive battles of Mellrichstadt (7 August 1077) and Flarchheim (27 January 1080), Gregory flip-flopped to support the revolt and launched a second anathema (excommunication) against Henry in March 1080, thereby supporting the anti-king Rudolf. However, the ample evidence that Gregory's actions were rooted in hate for the Emperor-elect instead of theology had an unfavourable personal impact on the Pope's reputation and authority, leading much of Germany to return to Henry's cause. On 14 October 1080 the armies of the two rival kings met at the White Elster river during the Battle of Elster, in the plain of Leipzig. Henry's forces again suffered a military defeat but won the battle with a strategic outcome: Rudolf was mortally wounded and died the next day at nearby Merseburg, and the rebellion against Henry lost much of its momentum. Soon after, another anti-king, Hermann of Salm, arose as figurehead, but he was fought successfully by Frederick of Swabia, Rudolf's Henry-appointed successor in Swabia who had married Henry's daughter Agnes of Germany. Henry convoked a synod of the highest German clergy in Bamberg and Brixen in June 1080. Here, Henry had Pope Gregory (whom he had dubbed "The False Monk") again deposed and replaced by the primate of Ravenna, Guibert (now known as the antipope Clement III, though who was in the right was unclear at the time). Henry entered Pavia and was crowned as King of Italy, receiving the Iron Crown of Lombardy. He assigned a series of privileges to the Italian cities which had supported him, marched against the hated Matilda of Tuscany, declaring her deposed for lese majesty, and confiscated her possessions. Then he moved to Rome, which he besieged first in 1081: he was compelled to retire to Tuscany, however, where he granted privileges to various cities and obtained monetary assistance (360,000 gold pieces) from a new ally, the eastern emperor, Alexios I Komnenos, who aimed to thwart Norman aims against his empire. A second and equally unsuccessful attack on Rome was followed by a war of devastation in northern Italy with the adherents of Matilda. Towards the end of 1082 the king made a third attack on Rome, and after a siege of seven months, the Leonine City fell into his hands. A treaty was concluded with the Romans, who agreed that the quarrel between king and pope should be decided by a synod, and they secretly bound themselves to induce Gregory to crown Henry as emperor or to choose another pope. Gregory, however, shut up in Castel Sant'Angelo, would hear of no compromise; the synod was a failure, as Henry prevented the attendance of many of the pope's supporters, and the king, pursuant to his treaty with Alexios, marched against the Normans. The Romans soon fell away from their allegiance to the pope. Recalled to the city, Henry entered Rome in March 1084, after which Gregory was declared deposed and Antipope Clement III was elected by the Romans. On 31 March 1084 Henry was crowned emperor by Clement and received the patrician authority. His next step was to attack the fortresses still in the hands of Gregory. The pope was saved by the advance of Robert Guiscard, duke of Apulia, who left the siege of Durazzo and marched towards Rome: Henry left the city and Gregory was freed. Gregory soon died at Salerno, in 1085, but not before a last letter in which he exhorted the whole of Christianity to a crusade against the Emperor. Feeling secure of his success in Italy, Henry returned to Germany. He spent 1084 in a show of power there, where the reforming instances had still ground due to the predication of Otto of Ostia, advancing up to Magdeburg in Saxony. He also declared the Peace of God in all the Imperial territories to quench any sedition. On 8 March 1088 Otto of Ostia was elected pope as Urban II. With Norman support, he excommunicated Henry and Clement III, who was defined as "a beast sprung out from the earth to wage war against the Saints of God". He also formed a large coalition against the Holy Roman Empire, including, aside from the Normans, the Kievan Rus', the Lombard communes of Milan, Cremona, Lodi, and Piacenza, and Matilda of Canossa, who had remarried to Welf II of Bavaria, thereby creating a concentration of power too formidable to be neglected by the emperor. In 1088 Hermann of Salm died, and Egbert II, Margrave of Meissen, a long-time enemy of the Emperor, proclaimed himself the successor of the anti-king. Henry had him condemned by a Saxon diet and then a national one at Quedlinburg and Regensburg respectively, but he was defeated by Egbert when a relief army came to the margrave's rescue during the siege of Gleichen. Egbert was murdered two years later, in 1090, and his ineffectual insurrection and royal pretensions fell apart. Henry then launched his third punitive expedition in Italy. After some initial success against the lands of Canossa, his defeat in 1092 caused the rebellion of the Lombard communes. The insurrection extended when Matilda managed to turn against him his elder son, Conrad, who was crowned King of Italy at Monza in 1093. The Emperor therefore found himself cut off from Germany; he was unable to return until 1097. In Germany itself his power was still at its height. Matilda of Canossa had secretly transferred her property to the Church in 1089, before her marriage to Welf II of Bavaria (1072–1120). In 1095, a furious Welf left her and, together with his father, switched his allegiance to Henry IV, possibly in exchange for a promise of succeeding his father as duke of Bavaria. Henry reacted by deposing Conrad at the diet of Mainz in April 1098, designating his younger son Henry (future Henry V) as successor, under the oath swearing that he would never follow his brother's example. The situation in the Empire remained chaotic, worsened by the further excommunication against Henry launched by the new pope Paschal II, a follower of Gregory VII's reformation ideals, who was elected in August 1099. But this time the Emperor, meeting with some success in his efforts to restore order, could afford to ignore the papal ban. A successful campaign in Flanders was followed in 1103 by a diet at Mainz, where serious efforts were made to restore peace, and Henry IV himself promised to go on crusade. A further important constitutional move by the Hohenstaufen's was made in this year, in 1101, where a new peace mechanism for the entire empire, the Landfrieden, was issued, under Henry IV at Mainz. This plan was shattered in 1104, however, by the revolt of his son Henry, who, encouraged by the adherents of the pope, declared he owed no allegiance to his excommunicated father. Saxony and Thuringia were soon in arms; the bishops held mainly to the younger Henry, while the Emperor was supported by the towns. A desultory warfare was unfavourable to the Emperor, however, and he was taken as prisoner at an alleged reconciliation meeting at Koblenz. At a diet held in Mainz in December, Henry IV was forced to resign his crown, being subsequently imprisoned in the castle of Böckelheim. There he was also obliged to say that he had unjustly persecuted Gregory VII and illegally named Clement III as anti-pope. When these conditions became known in Germany, a strong dissent movement spread. In 1106 the loyal party set up a large army to fight Henry V and Paschal. Henry IV managed to escape to Cologne from his jail, finding considerable support in the lower Rhineland. He also entered into negotiations with England, France, and Denmark. Henry was able to defeat his son's army near Visé, in Lorraine, on 2 March 1106. He died soon afterwards, however, after nine days of illness, at the age of 56, while he was the guest of his friend Othbert, Bishop of Liège. He was buried by the bishop of Liège with suitable ceremony, but by command of the papal legate he was unearthed, taken to Speyer, and placed in the unconsecrated chapel of Saint, which was built on the side of the Imperial Cathedral. After being released from the sentence of excommunication, his remains were buried in Speyer cathedral in August 1111. Henry IV in later life displayed much diplomatic ability. His abasement at Canossa can be regarded as a move of policy to strengthen his own position at the cost of a token humiliation to himself. He was always regarded as a friend of the lower orders, was capable of generosity and gratitude, and showed considerable military skill and great chivalry. Agnes (summer 1072/early 1073 – 24 September 1143), married firstly Frederick I, Duke of Swabia and secondly Leopold III, Margrave of Austria. In 1089 Henry married Eupraxia of Kiev (crowned Empress in 1088), a daughter of Vsevolod I, Prince of Kiev, and sister to Vladimir II Monomakh, prince of Kievan Rus. The title character in the tragedy Henry IV by Luigi Pirandello is a madman who believes himself to be Henry IV. 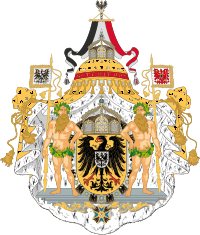 Kings of Germany family tree. He was related to every other king of Germany. 1 2 3 The Reform of the Church, J.P. Whitney, The Cambridge Medieval History, Vol. V, ed. J.R. Tanner, C.W. Previte-Orton, Z.N. Brooke, (Cambridge University Press, 1968), 31. ↑ Germany under Henry IV and Henry V, Z.N. Brooke, The Cambridge Medieval History, Vol. V, 116. ↑ Bertha in the meantime had retired to the Abbey of Lorscheim. ↑ Germany under Henry IV and Henry V, Z.N. Brooke, The Cambridge Medieval History, Vol. V, 140. ↑ Germany under Henry IV and Henry V, Z.N. Brooke, The Cambridge Medieval History, Vol. V, 141. ↑ Donald J.Kagay, L.J.Andrew Villalon (January 2003). Crusaders, Condottieri, and Cannon: Medieval Warfare in Societies Around the World. ISBN 9004125531. Retrieved 2008-06-05. One of two brief accounts of the battle of Volta reports it occurred on the same day as the battle of Elster (15 October 1080) in which Rudolf was fatally wounded. 1 2 Gregory VII and the first Contest between Empire and Papacy, Z.N. Brooke, The Cambridge Medieval History, Vol. V, 79. ↑ Germany under Henry IV and Henry V, Z.N. Brooke, The Cambridge Medieval History, Vol. V, 151. ↑ The chronicles of Jan Długosz and Archdiacon Sulger reported that she married Bolesław III Wrymouth, Duke of Poland at Bamberg in 1110 as her second wife. This view was challenged by Oswald Balzer (O. Balzer: Bolesław III Krzywousty, pp. 122-123) and contemporary charters and documents, who placed her as deceased in infancy or at least before 1101. Die Urkunden Heinrichs IV no. 466, p. 629 and no. 474, p. 644. ↑ Morkinskinna records that Magnus III of Norway “was much smitten” with “the emperor's daughter…with whom he had exchanged messages…Matilda”. No other reference to this alleged daughter has been found. Andersson, T. M. and Gade, K. E. (trans.) (2000) Morkinskinna (Cornell), 58, p. 307. ↑ Germany under Henry IV and Henry V, Z.N. Brooke, The Cambridge Medieval History, Vol. V, 145. I. S. Robinson, Henry IV of Germany, 1056–1106 (Cambridge, 1999). T. J. H. McCarthy: Chronicles of the Investiture Contest: Frutolf of Michelsberg and his continuators (Manchester, 2014). Gerd Althoff (Ed. ): Heinrich IV. (Ostfildern, 2009) (Vorträge und Forschungen; 69). Charter given by Henry to the bishopric of Bamberg, 17.8.1057. Photography taken form the collections of the Lichtbildarchiv älterer Originalurkunden at Marburg University showing the emperor's seal. Wikimedia Commons has media related to Henry IV, Holy Roman Emperor. "Henricus IV Imperator". Repertorium "Historical Sources of the German Middle Ages" (Geschichtsquellen des deutschen Mittelalters). Documents by Henry IV for the Bishopric of Bamberg, 17 August 1057, "digitalised image". Photograph Archive of Old Original Documents (Lichtbildarchiv älterer Originalurkunden). University of Marburg.